For any of our 4-H members who are also in FFA! 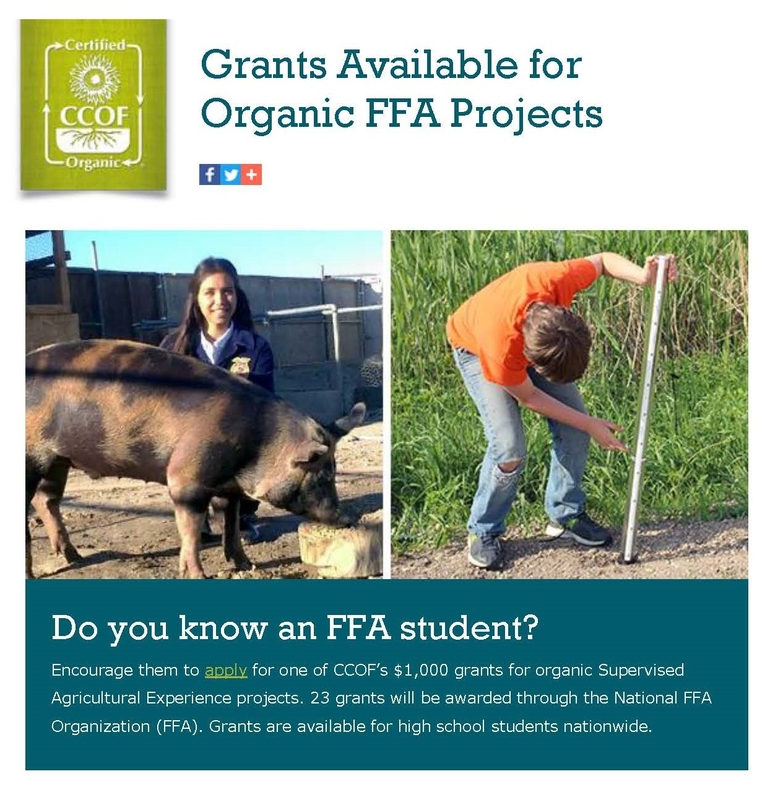 Grant applications for high school students wishing to pursue an organic Supervised Agricultural Experience project through FFA opened on September 5, 2017. Previous students have started Community Supported Agriculture (CSA) programs, raised organic cattle, and conducted water-quality testing on water runoff from organic farms. 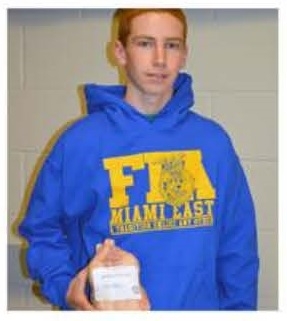 2016 winner Michael Blair used his grant to start Michael's Pastured Poultry, an organic, pasture-based chicken business on his parents' farm near Troy, Ohio. Blair used the grant to build a portable pen for the poultry and purchase a chest freezer to store his product between slaughter and market. These grants are part of the Future Organic Farmer Grant Fund, which seeks to expose students of all ages to organic agriculture. By connecting these students to resources that help fund their organic projects, CCOF is helping the next generation choose organic agriculture as a career path. Application instructions are available on the CCOF website and applications are due November 15, 2017. To learn more about the Future Organic Farmer Grant Fund, contact the CCOF Foundation at ccoffoundation@ccof.org or (831) 423-2263. The Future Organic Farmer Grant Fund is made possible through contributions from organic business and community leaders including CCOF, the UNFI Foundation, the CCOF Processor/Handler Chapter, the Clif Bar Family Foundation, Dr. Bronner's, Driscoll's, Duncan Family Farms, Frey Vineyards, Frontier Co-op, Heath & Lejeune, Gary and Meg Hirshberg, Lost Republic Distilling, Organic Valley, SunRidge Farms, and True Organic Products. Thank you to these organizations for helping us inspire the next generation of organic farmers!